Replacement canopy only. Metal frame not included. This replacement canopy fits the grill gazebo model number l-gz238pst-11. 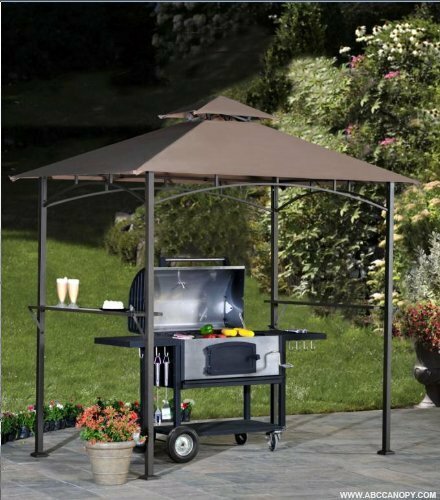 This grill canopy was originally sold at walmart stores and other retailers. Color: brown(different from original).garden winds is the trusted and leading manufacturer of replacement canopies for gazebos and swings. Fabric: polyester, uv treated, water-resistant, cpai-84 fire retardant, upf 50+. FABRIC: This canopy roof is made from Rip Lock fabric.UV treated, water resistant, CPAI-84 fire retardant. SOLD:This grill canopy was originally sold at Walmart Stores and other retailers. NOTE:Replacement canopy only and Metal structure not included.